I’ve talked before about how sometimes what you serve on the side of your dinner plate is the star of the meal, and this is another one of those times. Think onion rings: thin, light, crisp, with a good kick of spice, these are a far cry from those overly breaded, greasy rings served in so many restaurants, and they’re easy to make at home. 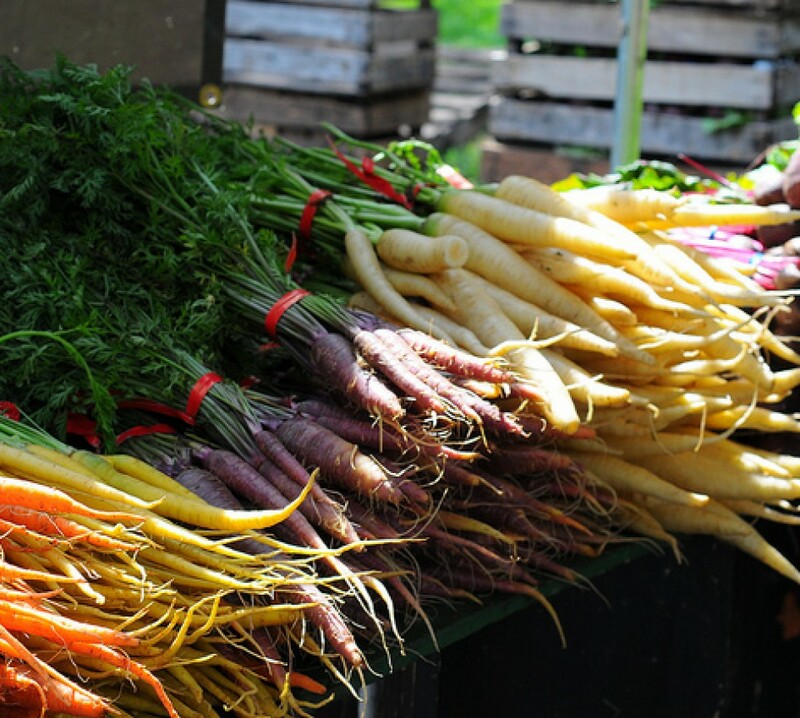 The two things to remember here are to have everything ready to go before you start, and to make them just before you’ll be serving them so they stay perfectly crisp. Peel the onion and slice it into thin rings. Separate the rings and place them into your bowl, then give them a healthy sprinkling of salt and as much Sriracha as you like. Toss until the onions are well coated, and set aside for 20 minutes or so, until the onions are soft and have given up much of their liquid. Pour oil an inch or two deep into the pot and heat until shimmering. Add flour to the zip-top bag. Remove the softened onions in batches, gently squeezing out the moisture with your hands, and add them to the flour a few at a time, tossing to coat. Shake off the excess flour and CAREFULLY lower the onions into the hot oil, frying them in batches until they are crisp and golden. Using your spider, remove the rings to the paper towel-lined plate to drain, sprinkling a bit of flaky salt on top of each batch you remove. Serve hot alongside your favorite steak, burger, or barbecue, with a frosty beverage alongside. Feel the love. Oh, lordy. It’s 9:15 in the morning and I’m craving onion rings. Don’t DO that to me! I feel the love! 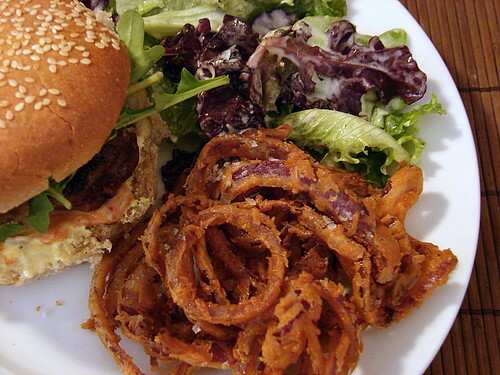 I have such a love of onions rings, not those nasty mass produced efforts though, the real thing. They look fantastic, ultra-crunch! Again. Another winner. Wow. So simple and yet so artful and the photos are priceless. Oh my… gorgeous! I never would have thought of leeching some of the water from the onions first. yep, early am and I am making a shopping list with red onions at the top of it! oddly, I just happen to have this very hot sauce in the cupboard (and I rarely have hot sauce as I am the only one that loves it) – found on a sale shelf at the grocer’s! Do make these. They’re ridiculously easy, and so, so good. I made these last year because of you, and how could you ever make onion rings without Sriracha again??? These are so good!! I dipped mine in a simple beer batter instead. So good! Oh wow! 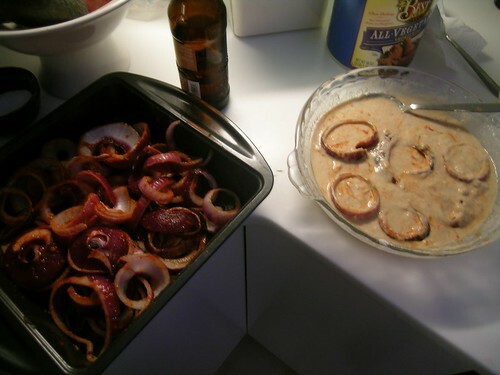 I was just thinking of trying my hand at making onion rings and came across ur entry. Am gonna try making some for this wkend’s BBQ. Many thnks! Luv ur site! 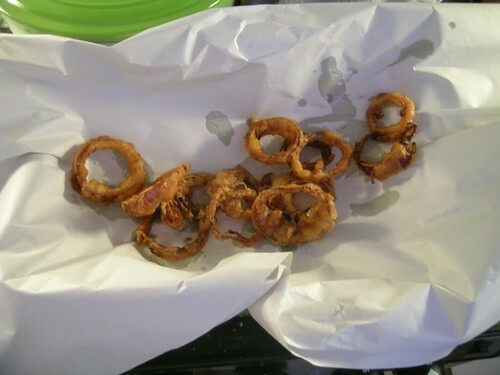 I tried these yesterday – they made the PERFECT addition to my memorial day cook out feast 🙂 I always thought you had to have a deep fryer to make onion rings, so I never tried them at home. These were so easy, thank you for the recipe! These sound DIVINE! I am going to have to try making some for our 4th of July BBQ on the Cape!